WIN A SIGNED COPY OF FAULTY PREDICTIONS! Leave a comment after Karin’s post AND then copy the text directly below and share it on Facebook or Twitter. That’s it, you’re entered. The winner will be randomly selected on December 10. 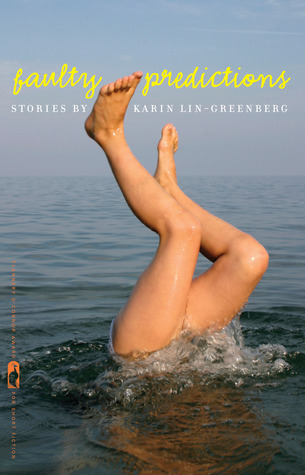 In this essay, written for Read Her Like an Open Book, Lin-Greenberg considers the need for patience and persistence in publishing in light of our increasingly impatient culture. Much of my childhood seemed to be about waiting. I owned a book called Free Stuff for Kids, and on each page there was information about something—a bumper sticker, a button, a poster—that kids could send away for and get for free in the mail. Corporations usually sponsored these free things, and the free items advertised their products. I didn’t mind the advertisements. I just thought it was fun to write a letter requesting a free button and then, six to eight weeks later, find a button declaring I loved a certain brand of cereal in a padded envelope in my mailbox. There was a book that was extremely popular in my elementary school’s library, D’Aulaires’ Book of Greek Myths, and everyone in my third grade class would wait for weeks for their turn to check it out. The library had two copies, the spines on each book reinforced with tape, the edges of the pages rounded from so many readings. During junior high, one of my parents would drive me to the Hollywood Video store up the street from our house on some weekend evenings. I’d always go right to the shelf of new release VHS tapes, and more often than not, the movie I wanted was checked out. So I would walk through the comedy section, pick an older movie to watch, and come back the next week and hope the video I wanted was on the shelf. Sometimes it would take a month before the video I wanted was actually available. I could go on and on about what I waited for during my childhood, but I’ll just give one more example. For my birthday one year, I got a rock tumbler. I plugged it into an outlet in the bathroom and let it run continuously for six weeks. Sometimes I would go into the bathroom and watch the barrel rotate, listen to the rocks clank as they fell to the bottom of the tumbler. Every week or two I’d stop the machine, wash the rocks off, and pour in a finer grade of abrasive grit. The rocks got smoother and smoother, until, during the last week, I poured polishing grit into the tumbler with the rocks, and finally, what emerged six weeks after I started were rocks that were shiny and beautiful. And now? Well, if you want a video, you can likely stream it. If you want a book that’s checked out of the library, you can download it to a device. If you want to know what’s so scandalous about a book you’re not supposed to read, you can Google a synopsis. I am willfully refusing to look up rock tumblers. I don’t want to know that there’s some special chemical that can now polish rocks overnight. I hope there’s not. I hope there are still things that people have to wait for. When I began to submit work to literary journals when I was in my mid-twenties, I was unfazed about the long wait times between my submissions and the responses I’d get from editors. After all, I’d been the kid who was delighted when, after waiting for two months, I got a bumper sticker in the mail with the logo of an orange juice company printed on it. I don’t like getting my stories rejected, but I do like getting responses to work I’ve sent out in the world. I have now been submitting work to journals for twelve years, and I’ve gotten used to the slow influx of rejections, some of them coming six, seven, eight months after I’ve submitted. I don’t feel impatient waiting for them; it’s just part of how things work. And once in a while there’s an acceptance, which is certainly something worth waiting for. Last semester, I talked to the students in my Writing Short Fiction class about submitting work to literary journals. I showed them a packet I’d put together of rejections I’d gotten over the years. Then I pulled up my Submittable account on the screen at the front of the classroom to show them how electronic submissions to journals work. I pointed at the dates when I’d submitted my stories and said that for some of them I’d been waiting almost a year to hear back. “If you wait for a long time, are they more likely to say yes?” asked one student. My students looked surprised. Or sort of surprised, but mostly sad. I imagined they were thinking how strange and unfair publishing was. Not only do people get rejected regularly, but you have to wait a long time to get this news. How terrible. Several weeks ago I accompanied two student editors of my college’s literary journal to a conference for editors of undergraduate literary journals. For two days, I was in a room full of ambitious young people who cared deeply about reading and writing and wanted to edit the best literary journals they could. One student editor, a freshman at an Ivy League university, gave a presentation about the pressure of publishing. She talked about attending a prestigious summer writing workshop for high school students when she was sixteen. One evening a few of the students were sitting on the lawn outside a building on campus where a famous literary journal was edited. The other students—all of them still in high school—were competitively comparing where they’d been published. They were boasting about their contest wins. The young woman felt miserable and dejected because she hadn’t been published yet. She felt so far behind her peers. When she returned home from the workshop, she started entering contests and didn’t win. She felt like a failure. Oh my god, I thought. I wanted to leap up on top of a table and scream that someone who’s sixteen has all the time in the world. They don’t need to worry about getting published. They don’t need to stress out about contests. Sure, enter contests if you want, but don’t kick yourself if you don’t win. It’s a cliché, but you win some, you lose some. That’s how life works. But I also understand that it’s not how life works for some kids. Some kids have only known success. And, hey, that’s great, but if you want to be a writer, you’ve got to get pretty familiar with rejection. Even if your work is good, you will inevitably get turned down at some point. While I listened to this young woman speak, I realized that the current epidemic of impatience wasn’t just confined to people not wanting to wait for individual rejections. It also involved people thinking that if they didn’t publish—and maybe if they didn’t get a book contract—before they were out of their teens, they had failed at being a writer. V: But How Can I Get Published? But here’s one thing that has changed: people have been asking me how they can get published. No one asked me this before my book came out. And, well, I don’t have a secret formula. I submitted, I waited, I revised. I kept working. I took old stories out of the collection and replaced them with new ones each year. I submitted individual stories to journals and the collection to contests. I entered dozens of contests for seven years. People have come up to me after I’ve done readings and asked for my advice about publishing. I’ve had adults do this, and I’ve had college students do it. I ask if they are taking classes and what they’ve been writing. Most of the time, people aren’t writing much but they have fantasies of being a writer. One man had a penname picked out already. One student—a biology major—said he’d never actually written a story before, but he thought it would be really cool to get some fiction published. I try to be encouraging and direct people to resources like The Novel & Short Story Writer’s Market and Poets & Writers magazine. If they are students, I encourage them to take writing classes. (I’ve also been told, however, “I don’t have time to take writing classes, but that’s okay because I already know how to write.”) As I’ve talked to more people who want to be published, this is what I’ve learned: a lot of people want to be published, but they don’t want to put in the work to get published. They don’t want to be patient, to work on their craft for years, and then to wait months for responses to their work. They just want to be published and they want it to happen quickly. And here’s the problem (and I apologize in advance for sounding like a curmudgeon): now anyone can be published. I’m talking Facebook, personal blogs, Twitter. These forums are great in many ways, but they also give people instant gratification. Post a photo of your cat on Facebook and within minutes you can get dozens of “likes.” Publish a piece in a print journal and you’re lucky if you even hear from one reader who enjoyed your story. When I’m dealing with strangers who ask for publishing advice, I just stay positive, encouraging, but when I’m talking to my own students, I can be a little tougher. This is what I tell them: I think the first questions, the questions that should come before “How can I get published?” are “How can I get as good as I can possibly get as a writer?” and “How can I learn more?” I tell them not to worry too much about publishing yet; publishing is the very last step, and in some ways it’s the least important. Getting better is the most important. It’s certainly what I care about with my own writing. I think if I only cared about publishing I’d have given up by now because of all the rejections over the years. But getting better, well, that’s something I can do on my own, something I can keep working on. I can keep studying published stories and novels I admire, I can keep revising and editing my own work, keep pushing myself to do better. So some final words of advice about publishing: Be patient and be persistent. Keep working on your stories until they’re as strong as you can make them before you send them out. Don’t worry if you’re turning seventeen or twenty-seven or eighty-seven and you haven’t published yet. Let’s go back to the rock tumbler. Let’s turn it into a metaphor. Think of your stories as those rocks that go into the tumbler. They’re dull and dirty when they start, but give them time and steady attention and what happens? They go from rocks to gems. Don’t send your writing out until you’ve worked on it over and over again, scraping away what’s not working, polishing every sentence. Be patient, give yourself all the time you need, and don’t send your work out until it shines. 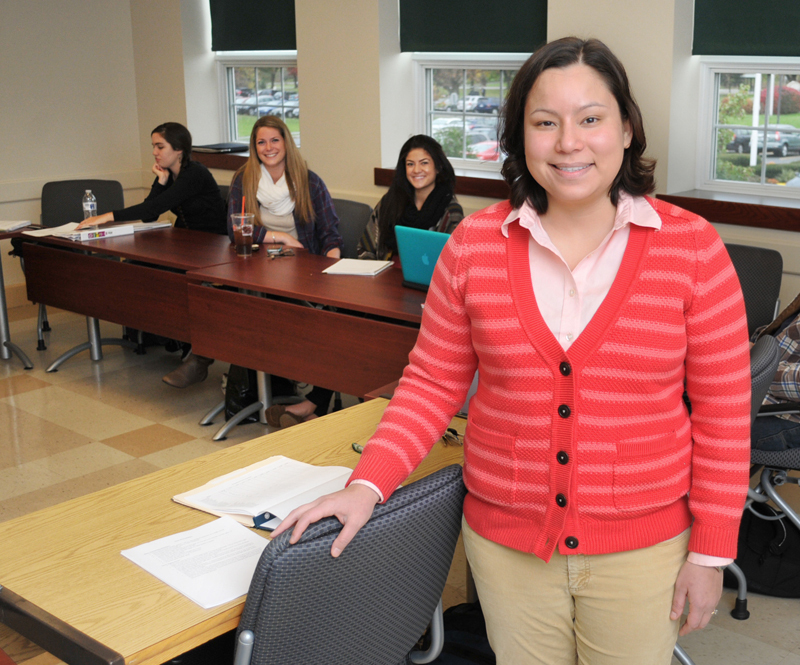 Photo at top left courtesy of Siena College. Fascinating essay wonderful view of writing &publishing.essay made me want to read the book even more.